Grant Street Group, the leading provider of web-based tax collection software in Florida, announced today that the Miami-Dade County Tax Collector’s office went live with TaxSys®, a state-of-the-art tax collection and billing system. Miami-Dade County, the 7th largest in the nation, collects over $4.6 billion in property taxes on more than one million parcels. 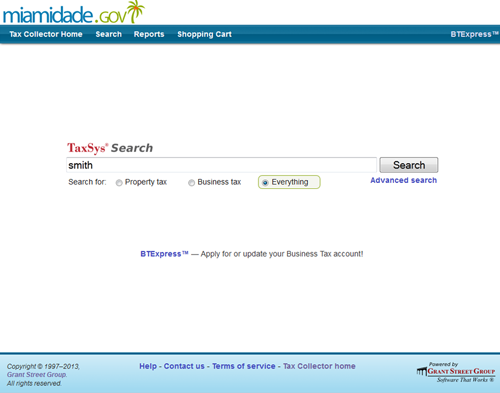 With the addition of Miami-Dade County, TaxSys will collect over 48% of all property taxes in the State of Florida. “The conversion from the County’s mainframe system to TaxSys was nothing short of a herculean effort from Grant Street Group and County staff,” said Fernando Casamayor, Miami-Dade County Tax Collector. “The project management expertise of Grant Street combined with the internal expertise of County staff allowed us to covert an enormous amount of data, execute new business processes, and coordinate a number of interfaces to critical county systems. Now that we are live, we look forward to the internal and public facing efficiencies we can leverage with TaxSys,” continued Mr. Casamayor. Miami-Dade County selected TaxSys after a competitive bidding process, which concluded in 2010. The County’s internally developed legacy system was over 25 years old, making it difficult for the Tax Collector’s office to evolve and streamline business processes. “This was a hugely successful project and we congratulate Fernando Casamayor and rest of the professionals at the County who continued their busy operations while working on the implementation,” said Ian Yorty, Grant Street Group’s Director of Florida Business Development. “A project of this magnitude – over 8.5 million converted accounts, billions of dollars in property tax, tourist tax, business tax, and state DMV transactions, and the delivery of critical public services – is a significant milestone for Grant Street Group and the Miami-Dade County Tax Collector,” continued Mr. Yorty. Miami-Dade County joins 14 other Florida County Tax Collectors who have selected TaxSys for their revenue collection needs since the system was launched in 2006. For more information, please contact Ian Yorty at (305) 710-8926, or Ian.Yorty@GrantStreet.com.